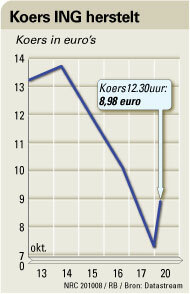 The state will inject 10 bln Euro’s in ING ($13.5 bln). The state will get two board seats, having veto rights on important issues such as divident, board salaries and acquisitions. The board members will not get any bonuses (and you and I know these bonuses are far far bigger than regular salaries). The board members will get severely limited step down packages (maxed to one year salary). The bank needs to repay this with an 8.5% interest rate, where the state acquires this money through secure and now very wanted state loans paying out 4%. Most people seem to think this is a pretty good deal for the taxpayer. What do you think, especially when compared with the Paulson’s bailout plan? What’s kinda funny is that the state has now a serious stake in two competing bank and insurance heavyweights. $2.1 billion tax payers money went up in smoke yesterday as a B-2 spirit crashed on take-off in Guam No fatalities, 20 left.